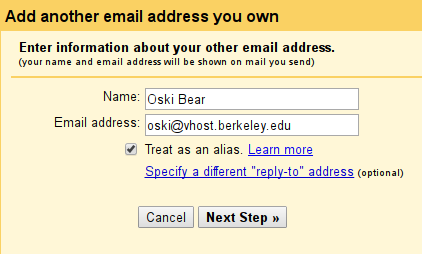 Note: Your berkeley.edu address is really just a branded Gmail account, so these steps also work using your Berkeley email. You can use either a personal or Berkeley email for these steps. Make sure you can receive mail. This must be done before you can start sending mail. Once this is done, try sending yourself an email at your new address and make sure you receive it. Set a password for the email. From the same page as before, make sure you've set a secure password for the email address. This is the password you'll use when configuring Gmail to send as your account. From Gmail, go to the settings page and start adding a new address. From your Gmail account, click on the settings wheel in the top-right corner, then click "Settings". At the top of the Settings page, click the tab that says "Accounts". From this page, click "Add another email address you own". Fill out the name and email. In the window that opened, fill out the first section with your name and the full email address. It's important to use the same email as in step 1. After filling this in, click "Next Step". 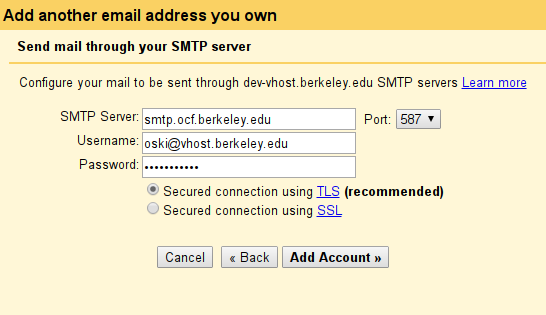 Fill out the SMTP server details. Username: The full email address, including @mygroup.berkeley.edu at the end. Password: The password you chose in step 2. Click "Add Account" when done. You'll now be sent an email with a link to click to verify the address. This should have arrived at the same Gmail account. Click the link in that email and you're good to go! If you use the Gmail app on your iPhone or Android device, you'll be able to select the From address there as well. Having trouble with the above steps? If you're stuck and can't figure out what's wrong, feel free to drop by our staff hours for in-person help!